In the invisible, parallel world of Earth's they kill half the bacteria in the ocean every day, and invade a microbe host 10 trillion times a second around the world. There are 10 billion trillion, trillion viruses inhabiting Planet Earth, which is more stars than are in the Universe — stacked end to end, they would reach out 100 million light years. Occasionally, a retrovirus will end up in a sperm cell or an egg and insert its genes there, which then may give rise to a new organism, a new animal, a new person where every cell in that body has got that virus. In 2009, MIT researchers have explained why two mutations in the H1N1 avian flu virus were critical for viral transmission in humans during the 1918 pandemic outbreak that killed at least 50 million people — believed more than that taken by the Black Death, and higher than the number killed in World War I. The 1918 flu pandemic — commonly known as the Spanish flu — was an influenza pandemic that started in the United States, appeared in West Africa and France and then spread to nearly every part of the globe in three waves lasting from March 1918 to June 1920, spreading to the Arctic and remote Pacific islands. 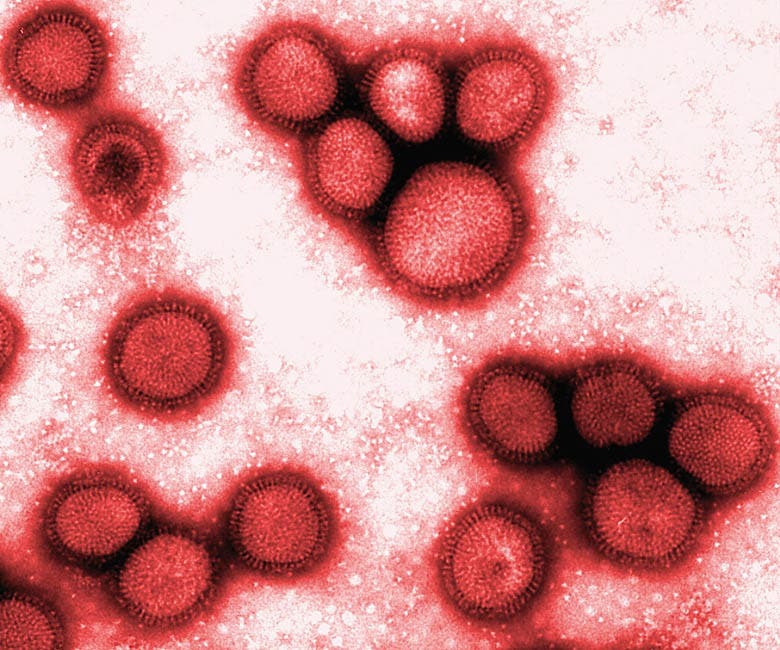 It was caused by an unusually severe and deadly Influenza A virus strain of subtype H1N1. 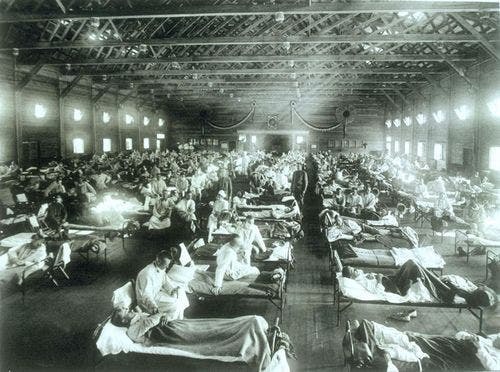 In contrast to most influenza outbreaks which predominantly affect juvenile, elderly, or otherwise weakened patients, the Spanish Flu also claimed healthy young adults, resulting from infection rates of up to 50% and the extreme severity of the symptoms, suspected to be caused by cytokine storms. The disease was first discovered at Fort Riley, Kansasand Queens, New York , in 1918. In August 1918, a more virulent strain appeared simultaneously in Brest, France, in West Africa at Freetown, Sierra Leone, and in the U.S. at Boston, Massachusetts. The Allies of World War I came to call it the Spanish Flu, primarily because the pandemic received greater press attention after it moved from France to Spain in November of 1918. The MIT team showed that the 1918 influenza strain developed two mutations in a surface molecule called hemagglutinin (HA), which allowed it to bind tightly to receptors in the human upper respiratory tract. Fast forward to the apst few years, with the reports of a massive outbreak of E. coli in Europe, which seemed to fit the pattern: people were infected with E. coli apparently after eating contaminated vegetables. But when German hospitals sent samples of the E. coli to the Beijing Genome Center on June 2, 2011 to have their DNA sequenced, the Chinese researchers reported that the strain was not the same E. coli that contaminated the spinach, known as O157:H7. In fact, it was an entirely different strain of E. coli, called O104:H4, that had never been associated with epidemics. Somehow this obscure microbe had turned savage, triggering one of the biggest — if not the biggest— E. coli epidemics in history, with at least 1,730 infections and 18 deaths to date. “We didn’t know this bug was out there,” said Phillip Tarr, a microbiologist at Washington State University in an interview with Newsweek. What makes these outbreaks particularly confusing, reports Carl Zimmer, author of The Rise of Superbacteria, is that E. coli is, for the most part, a harmless creature. We are each home to billions of harmless E. coli that inhabit our intestines. "But in the mid-1900s," writes Zimmer, "scientists began uncovering strains of E. coli that could cause life-threatening diarrhea. Unlike ordinary E. coli, they carried genes for a poison known as Shiga toxin, named for Japanese bacteriologist Kiyoshi Shiga. Over time, microbiologists identified a number of strains of disease-causing bacteria, classifying them by the proteins on their surface. In 1982, E. coli O157:H7 burst on the scene with particularly grisly flair. It struck 25 people in Medford, Ore., and then three months later the same strain caused an outbreak in Traverse City, Mich. Scientists were able to trace the bacteria back to undercooked hamburgers." Scientists have found a half dozen other strains that cause similar illnesses, but E. coli O157:H7 has been responsible for the lion’s share of E. coli food poisoning, striking again in 1993 in contaminated hamburgers in Washington state, for example, sickening 732 people and killing four of them. But it has not used just hamburger to infect its victims. Along with the spinach outbreak of 2006, E. coli O157:H7 has turned up in lettuce, bean sprouts, and even cookie dough. A deadly new strain of E. coli has spread fear across Europe about meat and vegatables.The sudden debut of E. coli O157:H7 in the 1980s made many people wonder how it had come to be. Was it the monstrous product of the modern food industry? Tarr and his colleagues analyzed the genome of the bacteria to estimate its time of origin. “These organisms have been around for 7,000 years,” says Tarr. It’s possible that E. coli O157:H7 and other pathogenic strains caused outbreaks for centuries before microbiologists could identify them as the cause. A look at the genetic makeup of E. coli O157:H7 is cause for even more concern. It evolved into a deadly pathogen by picking up genes from other bacteria through a process called recombination. Viruses, for example, can move from one E. coli to another and insert genes from their old host into a new one. “E. coli are a cauldron of recombination,” says Tarr. The European strain did not belong to any of these well-known suspects. Initially, it appeared that the bacteria were coming from cucumbers and other vegetables from organic farms in Spain, but O104:H4 has not turned up in tests at those places. Researchers are now left to wonder where exactly it came from. The O104:H4 genome sequence suggests that it’s yet another concoction from evolution’s brew. The bacteria contain many segments of DNA not seen in other E. coli strains, writes Zimmer. "This new DNA may be responsible for its high level of virulence—more than a quarter of victims went on to develop the dangerous form of the disease," he added "The O104:H4 strain has even acquired new genes that make them resistant to antibiotics. As a result, doctors have few options to treat the bacteria. In Germany, physicians are resorting to an experimental antibody treatment to see if it can help." 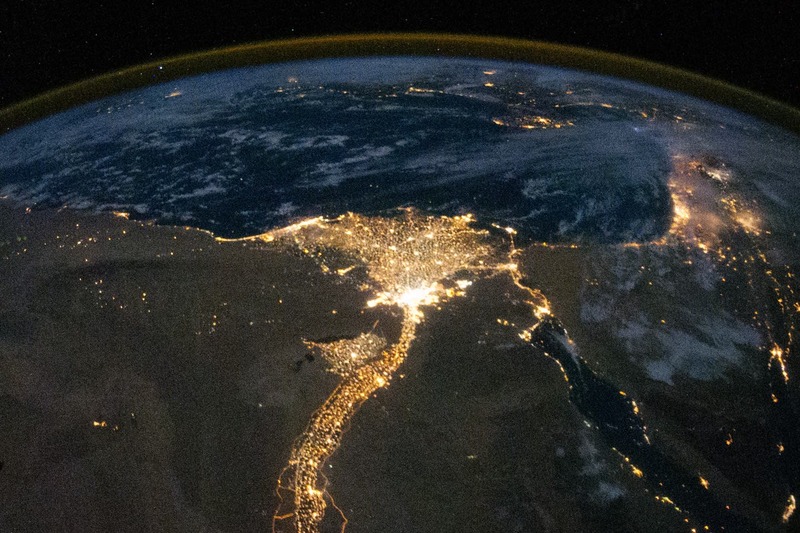 “Microbes are always going to be one step ahead of us. Their generation time is 24 hours, ours is 30 years. They mutate, they change, they will find a way. They are amazing opportunists,” writes Dorothy Crawford, Professor of Medical Microbiology at the University of Edinburgh and author of Deadly Companions. Microbes have evolved with us over the millennia, shaping human civilization through infection, disease, and deadly pandemic. Beginning with a dramatic account of the SARS pandemic at the start of the 21st century, As our move from hunter-gatherer to farmer to city-dweller accelerated, we became ever more vulnerable to microbe attack. With increased crowding and air travel putting us at risk, Crawford wonders whether we might ever conquer microbes completely, and whether we need a more microbe-centric view of the world.